The presence of microvascular obstruction (MVO) in acute myocardial infarction (AMI) is associated with more severely impaired left ventricular function and poor prognosis. The aim of the study was to evaluate whether a single cardiac troponin T-value (cTnT) is able to predict presence of MVO and whether cTnT is an independent predictor of MVO as compared to usual risk factors of MVO. Eighty-nine consecutive patients with reperfused AMI after PCI were enrolled in the study. cTnT was measured serially at admission and after 24, 48, 72 and 96 hours. Contrast-enhanced cardiac magnetic resonance imaging (CE-MRI) was performed on a 1.5 T scanner 4 ± 1 days after AMI. To evaluate myocardial distribution of hyperenhancement, data were aquired 15 min after bolus injection of 0.2 mmol Gd-DTPA (Magnevist®) using an inversion-recovery three-dimentional turbo-gradient echo technique. Data were evaluated on a regular workstation (Philips Viewforum). MVO was visually defined as hypoenhanced area within hyperenhancement and was manually contoured. All single measurements, peak cTnT and concentration-time integral of cTnT over 96 hours were related to size of myocardial infarction and MVO as determined by CE-MRI. CE-MRI was feasible in all patients with excellent image quality. 39% of the patients presented with MVO. cTnT-time concentration kinetics in the presence of MVO differs from cTnT release in the absence of MVO showing a higher peak and a slower release. At single point measurement 24 h-cTnT correlates at least as well with the presence of MVO (p = 0.0015) as peak cTnT (p = 0.0204) and sampling over 96 h (p = 0.0106). Using ROC analysis, at single measurement a cTnT concentration > 2.52 μg/L at 24 hours was the best predictor of MVO (AUC 0.7) with a sensitivity of 67% and a specificity of 85%. 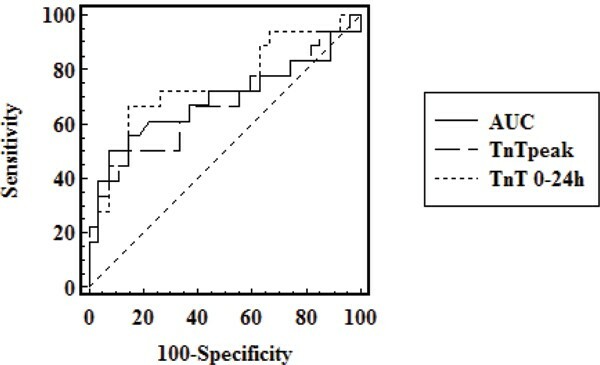 Multivariate regression analysis demonstrated that infarct size and cTnT at 24 hours after admission remained independent predictors of MVO after adjustment for duration of ischemia, and spontaneous preinterventional TIMI grade 3 flow. Figures 1 and 2. 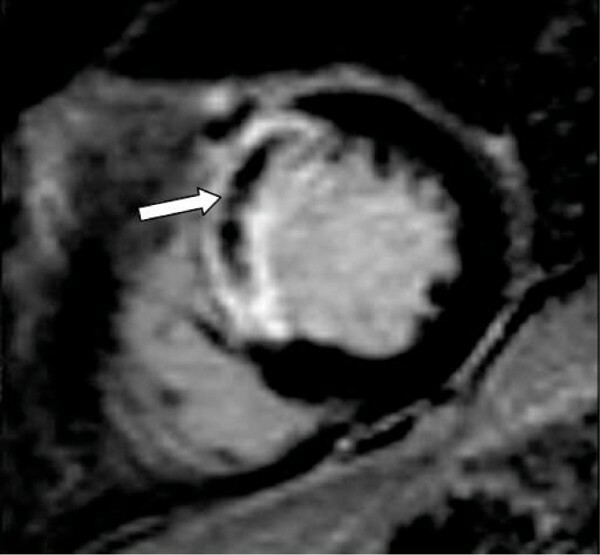 Transmural infarct of the left anterior wall with presence of severe MVO (arrow). Prediction of MVO by single and serial measurements of cTnT. ROC curves of cTnT24h (AUC = 0.747 (0.595–0.0.864)), peak cTnT (AUC = 0.669 (0.513–0.802)) and conc.-time integral of cTnT over 96 h (AUC = 0.669 (0.513–0.802)) demonstrate a comparable performance of single and serial cTnT measurements. In AMI a single 24 h cTnT value is an independent predictor for MVO and is at least as predictive as serial cTnT-measurement.